It’s the sneaky finger of melting dough, the sweet and comforting smell of them cooking and the melodious sound when you bite into them. These are only some of the reasons why we all love cookies. But when one cannot use milk, wheat or eggs, buying these wonders becomes much more difficult. Many people suffer from food intolerances which, will rarely be life-threatning but, can slowly act as a poison and lead to a variety of symptoms. Food intolerances can get better but, it often goes through a period of evicting the culprit which can be more or less long. During this period, it is not rare to crave all the wrong food and it is true that it involves a real reinvention of the way one eats and cooks so here is an adventure I invite you to follow with me through my specific articles and recipes. 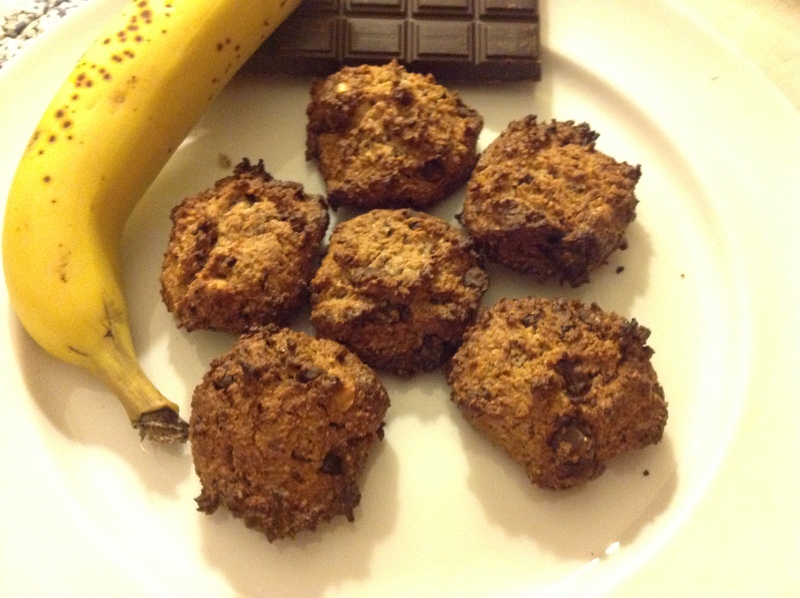 For the cookie craving, here are two recipes for all to enjoy. Heat the oven at 180 °C. Break or crush the chocolate, nuts and dried fruits. In a separate bowl, crush the banana and add the hazelnut powder, the brown sugar, chocolate, nuts and fruits. Mix in the flour and baking powder. Place spoonfuls of dough on baking paper and cook for about 25 minutes. Préchauffer le four à 180°C. Écraser le chocolat, les noix et/ou fruits secs. Écraser la banane dans un autre récipient et ajouter la poudre de noisettes, le sucre de canne, le chocolat, noix et/ou fruits sec. Ajouter la farine et la poudre levante et placer des cuillerées sur une feuille de papier cuisson sur une plaque dans le four pour 25 minutes environ. – 100 g of dried currants and crushed hazelnuts – 100 g de raisins secs et noisettes concassées. Heat the oven at 180 °C. Mix the margarine with the hazelnut powder and the sugar. Incorporate the different flours, the baking powder, the dried currants and hazelnuts and mix well. Form small balls and place them on baking paper in the oven for about 15 minutes. Préchauffez le four à 180 °C. Mélanger la margarine avec la poudre de noisette et le sucre de canne. Incorporer les différentes farines, la poudre levante ainsi que les raisins secs et les noisettes. Bien mélange. Former de petites boules et placer sur une feuille de papier cuisson dans le four pendant environ 15 minutes. Let us know what you think about these recipes ! Faites nous savoir ce que vous pensez de ces recettes! Oh, neat recipes! Hazelnut flour – what a great idea!